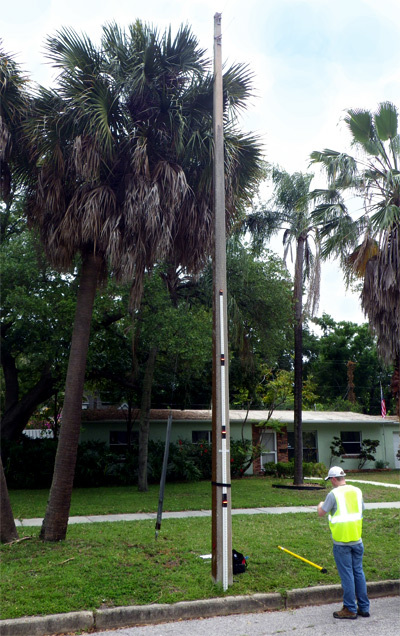 RTS Associates is an outside plant utility contractor that delivers field services for the telecom industry. One of the company's projects involves gathering information about telephone infrastructure across the southeastern U.S. for a national telecom provider. Previously, field personnel were recording inspection data using pen and paper, which later had to be re-keyed into spreadsheets. This process was leading to inaccuracies and delays. The management team wanted to improve efficiency and customer service with a mobile solution for collecting field inspection data. The team selected Flowfinity to design and deploy a fully customized mobile solution in less than one day. "Once I saw the capabilities the Flowfinity mobile platform and how you could customize it, I knew it was exactly what we needed. I did a quick calculation on the cost of the app compared to what I spend on data entry in one week, and saw that the software would pay for itself almost immediately," said Ryan Hart, Director of Wireless Operations, RTS Associates. For inspection projects, personnel at RTS Associates travel to a location and typically spend up to ten hours a day in the field. Prior to using Flowfinity, they would also spend several hours each night copying their inspection data into spreadsheets. "We would print out hard copies of the form that our client supplied, write everything out in the appropriate columns by hand during the day, and move all of that data manually into Excel in the evenings," said Hart. "It was a very tedious process, and data entry was costing a lot of money." Copying data from handwritten forms into spreadsheets also resulted in errors. As a result the data had to be manually checked and re-checked for accuracy before submitting it back to the client. "We are dealing with data like GPS coordinates, which are 8 characters long for each latitude and longitude, multiplied over hundreds of locations. I would have to plot GPS coordinates on a map and visually check for outliers," said Hart. "One project could take up to 2 to 3 days to review the data for accuracy. It was very time consuming." RTS Associates' clients have specific deliverables, and in some cases if the client were to reject a deliverable, the team would have to return to the location to investigate further. RTS Associates selected Flowfinity, a powerful mobile form and workflow platform, to replace paper inspection forms with a mobile app. The management team opted for a cloud-hosted solution, which enabled them to deploy a solution quickly. "We selected Flowfinity software along with Professional Services to customize a mobile solution for us, and it was tailored exactly to meet our client's needs," said Hart. "The solution was designed in less than a day." Now field personnel enter inspection data directly into Flowfinity on iPad devices throughout the day, and no longer need to spend long hours transcribing data. "Flowfinity has provided us significant cost savings, and also significant time savings," said Hart. "By eliminating data entry alone, we were able to reduce labor costs by about 30%." "By eliminating data entry alone, we were able to reduce labor costs by about 30%." Inspection data is now reviewed almost immediately, so that any possible issues can be addressed before the team leaves a location. This reduces the possibility of having to revisit a location to gather more information, and saves days of management time for every project. "Now that inspection forms are completed in the field on mobile devices, our data is much more accurate," said Hart. " I receive the field data right away, quickly check for anomalies, and finish proofing reports in 15 to 20 minutes rather than going through a several day review process." The Flowfinity app was created to match the requirements of RTS Associates' client deliverables, so that minimal effort is required to turn around reports now. As soon as field data comes in, it can be quickly reviewed and sent to the client. "Our clients appreciate that they receive reports faster now," said Hart. Flowfinity software is fully customizable without programming, so any required app changes can also be made quickly. When client needs change, RTS Associates can update their mobile app quickly and cost-effectively. "Every time our client requires a change to their deliverable, the Flowfinity app can be quickly updated to meet their exact requirements," said Hart. "It's a very agile platform." "Every time our client requires a change to their deliverable, the Flowfinity app can be quickly updated to meet their exact requirements. It's a very agile platform." "Once I saw the capabilities the Flowfinity mobile platform and how you could customize it, I knew it was exactly what we needed. I did a quick calculation on the cost of the app compared to what I spend on data entry in one week, and saw that the software would pay for itself almost immediately." Flowfinity has provided us significant cost savings, and also significant time savings. By eliminating data entry alone, we were able to reduce labor costs by about 30%.